The Paris Agreement represents significant progress. One major success is the commitment to review national pledges every five years, starting in 2018. If nations offer deeper, earlier emissions cuts at that time and continue progress, projected warming could be limited to 2°C (3.6°F), according to analysis by Climate Interactive and MIT Sloan. Background assumptions and additional graphs and tables are available here. In 2018, strengthened INDCs would need to include (1) deeper emission reductions by 2030, (2) longer term targets with substantial cuts in emissions, and (3) participation by all nations. 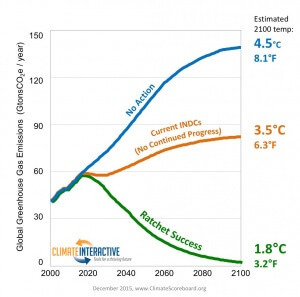 Success would require increased support from developed countries to developing countries, but do not require negative emissions late in the century. In 2018, the EU would pledge to reduce emissions 47% below 1990 levels (45% below 2005 levels) by 2030, improving on its current pledge of a 40% cut below 1990 levels. In 2018, the U.S. would pledge to reduce emissions 45% below 2005 levels by 2030, improving on its current pledge of a 26% drop below 2005 levels by 2025. The other developed countries would match the 45% pledge. In 2018, China would commit to peaking emissions by 2025, not 2030. 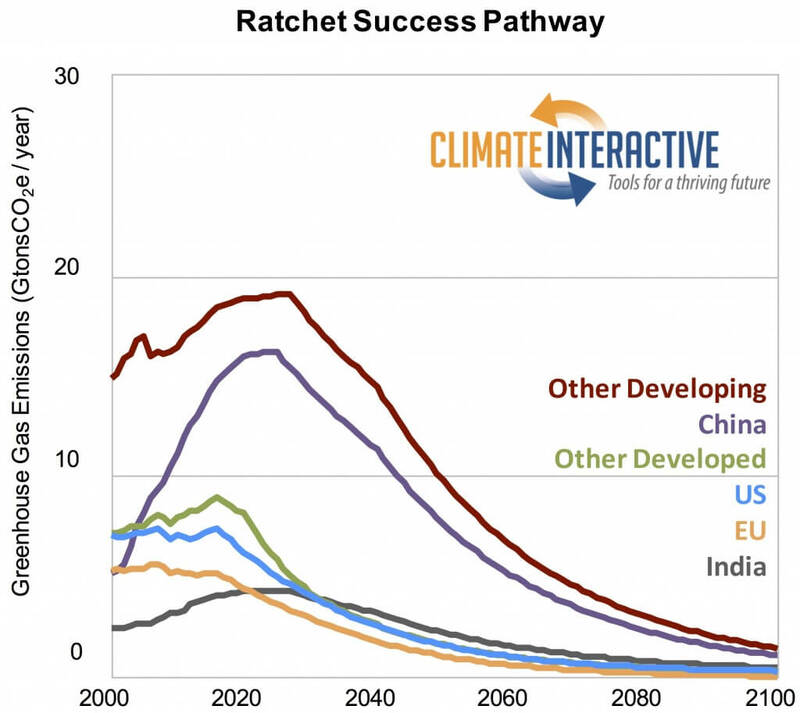 Other developing countries would commit to a peak by 2027. After 2030, long-term pledges in the developed world would bring emissions 80% below 2005 levels by 2050 and continue reductions through the century. In China and the developing nations, emissions would fall after their peaks in 2025 and 2027, initially at 2% per year, with faster drops after 2040 as clean, renewable energy and efficiency grow. 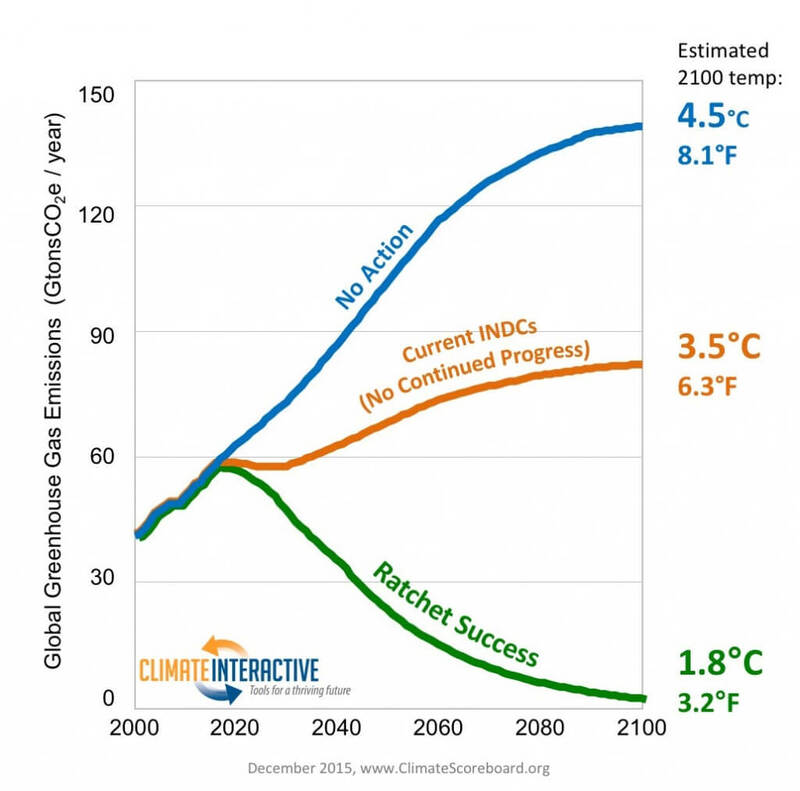 The INDCs in the Paris Agreement, assuming no further progress with the pledges, would put the world on track for a global temperature increase of 3.5°C (6.3°F) above pre-industrial levels, with a range of uncertainty from 2.1 to 4.7°C (3.7 to 8.4°F), down from the 4.5°C (8.1°F) of warming expected if nations continue business-as-usual. 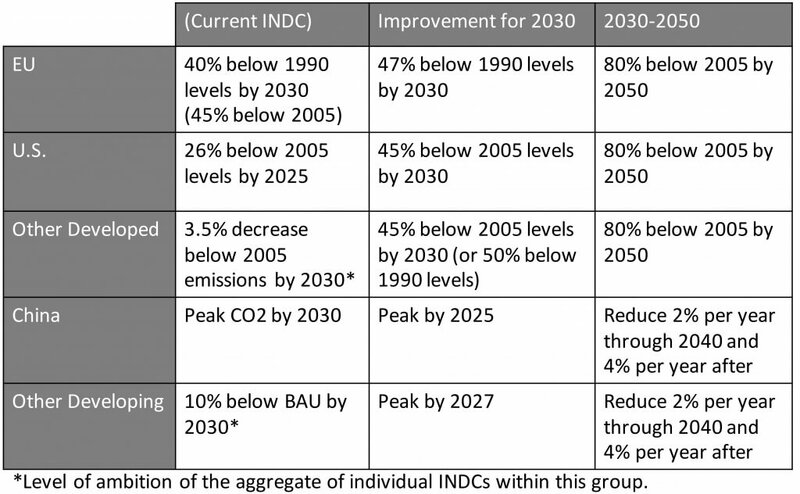 Below: Current INDCs in the Paris Agreement and improvements needed in 2018 required to limit warming to 1.8°C (3.2°F) for five regions of the world. More details. 4.5°C (8.1°F), with a range of uncertainty from 2.6 to 5.9°C (4.8 to 10.6°F). 3.5°C (6.3°F), with a range of uncertainty from 2.0 to 4.6°C (3.6 to 8.2°F). 1.8°C (3.2°F), with a range of uncertainty from 0.9 to 2.4°C (1.7 to 4.4°F). Above: Greenhouse gas emissions from 2000-2100 for six regions of the world, leading to a 2100 temperature increase of 1.8°C (3.2°F). Climate Interactive’s Climate Scoreboard analysis, produced in partnership with the Massachusetts Institute of Technology Sloan School of Management (MIT Sloan), analyzes the intended nationally determined contributions (INDCs) put forward to the UN climate talks. The Scoreboard is calculated with the C-ROADS (Climate Rapid Overview and Decision Support) computer simulation, which is calibrated to the Intergovernmental Panel on Climate Change’s (IPCC) Fifth Assessment Report results. C-ROADS emerged from research at MIT Sloan and allows users to select real and potential mitigation proposals from around the world. It then simulates these emissions’ impacts on greenhouse gas concentrations, temperature change, per-capita emissions, cumulative emissions, sea-level rise, and other indicators. C-ROADS is downloadable and available for public use. Background assumptions and additional graphs and tables are available from the project leads, below, or here. Jennifer Haskell, jhaskell-at-climateinteractive.org, phone/SMS +1-703-231-1835. For further information: www.climateinteractive.org/tools/scoreboard/. Inquires at info-at-climateinteractive.org. Twitter @climateinteract. are we just talking about slowing down G.W. or actually decreasing it? Will we ever be back at say 1900 temperatures again? Or will that take about 2,000 years? It’s 14c here in the UK a week before X-,mas..and I hate it!